This question from my 2015 survey may pique curiosity among some APEX developers. Q6: How do you instrument your code? 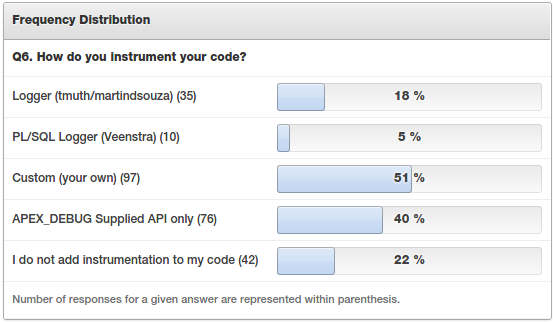 Hopefully those in the 22% who do not add instrumentation just didn't understand the question. Instrumentation is another term for adding debugging information to your code. There is plenty of commentary on this topic and done right it can make tracking down problems a breeze. It can be as simple as knowing when a procedure was called, and with what parameters. Take the following procedure definition with instrumentation (debug logs) added. I think you're essentially coding blindfolded without it. You could only infer this procedure was executed because of whatever it does, and if something goes wrong how do you know what was passed in? Where did it get up to? Did it execute at all? Imagine using the database without the ALL% dictionary views. They're essentially instrumentation to your database. Tom Kyte has some particularly good talks on the topic, and a few chapters in his various books. It's very much a PL/SQL thing, but since APEX pages are generated via PL/SQL, there is a natural solution with the supplied apex_debug package. Any process can add information to the APEX debug log, which is only collected while debug is on. There is no reason why you shouldn't instrument any PL/SQL, and have the granular control to turn on/off at will. Libraries are available to make this job easier. PL/SQL Logger can be found here, if you want to compare solutions or look for ideas, read other people's PL/SQL. Despite recommending it a few times, I've never actually used Logger on-site (sorry Martin). For quite some time I've had a basic infrastructure of my own that has worked fine, using the same premise. That being said, it's on my list to convert/upgrade when the timing is right. Partially because I've followed it's progress, know who wrote it, and inspected the code. I look forward to benefits some extra features will bring. The next few questions also relate to instrumentation, so stay tuned. I was introduced to Logger early this year and switched over to it, haven't looked back. Highly recommended. I made a small modification to duplicate the messages into the Apex debug log.